Food Wishes Video Recipes: Spicy Thai-style Steak and Rice Noodle Salad – Hot and Cold, Sweet and Sour, Soft and Crisp; an adventure in culinary contrasts! Spicy Thai-style Steak and Rice Noodle Salad – Hot and Cold, Sweet and Sour, Soft and Crisp; an adventure in culinary contrasts! This is my favorite Asian-style noodle salad. There are so many different flavors, temperatures and textures mingling together. I love almost any pasta salad with meat, but what I really love about this one is the chewy rice noodles I use as the base. As you’ll see, they don’t really get “cooked,” but simply covered in very hot water for 8 minutes before being drained and rinsed in cold water. You should be able find the rice noodles (sometimes called Rice Sticks) in the Asian section of any large grocery store. They are a perfect contrast to the crisp cold vegetables mixed into them, which is a perfect contrast to the warm savory slices of the spicy steak, which is perfect with the sweet and tangy peanut dressing, and so on. This is just a fun dish to eat. The beef we’re using for the salad is skirt steak. It’s very flavorful and easy to work with. You’ll find it next to the flank steak in the butcher case. While you’re in the Asian section at the store there’s couple of exotic ingredients we’ll need to pick-up. For both the dressing, and to marinate the steak, we need Shiracha, which is a hot Asian chili sauce. We’ll also use Asian Fish Sauce in the marinade. This is a very common addition to many Southeast-Asian dishes and is well worth finding at the market! By the way, you should still have some fish sauce leftover from the caramel chicken recipe. The Peanut dressing I also demo in this post is a very basic version, and doesn’t have lots of additional ingredients since I usually use this as a base for other recipes, as I did here. As Chefs are always telling young cooks, you can always add ingredients, but you can’t take them out. Enjoy! for this steak you are... its pretty thin and cooks very fast, you want a nice sear on it. I used this wet rub for a NY strip and grilled it. Tasted great. In that sauce you sweat the garlic a bit in oil to take that raw edge off. Combined with the honey, it makes for a mellower sauce but still spicy and delicious. You'll probably never see this, John, but I'll try. 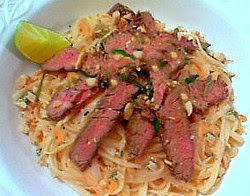 I made this yesterday, having ordered 6 boxes of the Taste of Thai cut rice noodles so happy to discover them pre-cut! Unlike other rice noodles I've used, these stuck together in the hot water and after 8 minutes I was tediously pulling them apart. I did stir them but...what a mess. Have you had that happen with these noodles? Don't think I've used them before! Sorry! You will probably never see this - but can the noodles and vegetables and mint and sauce be combined in advance and just topped with the meat the next day? Would that impact the noodle salad? Thanks! We’re off to Sonoma! See you on Tuesday. Exotic Pomegranate Chicken – Hey, Nice Legs! Croque Monsieur… King of the open-face sandwich! 12 Second Coleslaw… in 42 seconds! TGIGF: Thank God it’s Good Friday! Béchamel Sauce - Let’s Turn This “Mother” Out!